This article appeared in the Gauntlet on September 20, 2012. It was late Saturday night in Black Rock City, Nevada — site of the infamously intense Burning Man festival. As I relished in the comedown of another acid trip, I stood witness to the burning of “Wall Street,” which stood as five full-sized buildings, ironically beautiful representatives of capitalism’s financial vanguard: corporate banks. The fire that engulfed them was immense in size, ferocity and brightness, reducing the structures to smoldering coals atop the desert dust. Raw joy and satisfaction bubbled throughout my entire being, and then, as we gathered around the remaining ashes, a peaceful stillness set in. 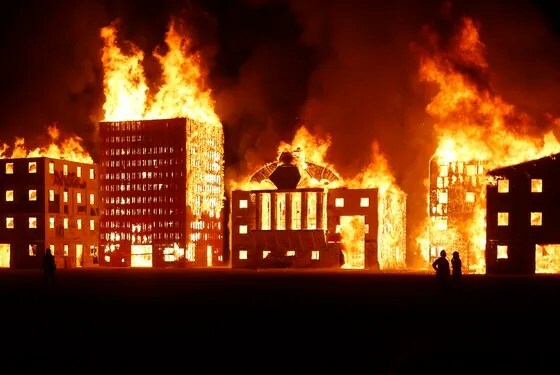 While the entire week of Burning Man left me with countless thoughts each to be pondered in their own right, the question of the significance of Wall Street’s burning continued to linger as one of the heaviest issues. I wondered if anyone beyond the several thousand ‘burners,’ huddled together in a dusty corner of the desert, would be tripped-out by such a politically-charged artistic act. I wondered if anyone beyond we burners could care, or even ought to care. Yet surely such an intense act could not leave our hearts untouched, nor could it be ignored by mass media or those in power. However, when it came time to bring sage words to the question of the significance of mock Wall Street’s burning, I was initially silent, all my thoughts had become still, just as I had been as I stood before the buildings’ ashes. But, as it turns out, that is the point. That is the significance. A fire, incomparable to any other, occurred before me and I basked in its brilliance — neither thought nor action (and especially not words) were necessary. My eyes were open, as was my heart. For those who have had the opportunity to immerse themselves in sport, there is a moment when thought and action unite, the distinction between them melts and performance becomes singular. Being ‘in the zone,’ as it were. I receive a pass, take a shot and score — neither thought nor action guided me, as it was mindless, a moment of ‘oneness.’ Our radicality, our dream of a better world, needs this same sensation of oneness. The burning of mock Wall Street, the significance that can be drawn from it, lies in that ‘zone’ of which I speak. The fire was a figurative and literal melting of theory and practice. Practice informed theory, like the brilliance to construct and enact a mock burning of Wall Street. And theory emerged from practice, just as the flames that leapt out of Wall Street’s windows ignited a fire in our hearts and inspires us with new ideas and dreams, while also giving us the space to construct something new atop the ashes. For those of us who dream of a better world — those of us who know a better world is possible — the burning of mock Wall Street is an incredible gift. Moving forward, my radicality is informed by the sensation of the becoming one with thought and action, of theory and practice, just like the stillness I felt in the face of the flames. That is to say, we are hopeless without theory and hopeless without action, but when the two meet and melt together — an occasion only feasible through the stillness born in opening our hearts, which sometimes takes a fire for us to feel — then our adventures, encounters and experiments begin, in their own right and on their own terms, to create a better world upon the ashes of the old. This article appeared in the Gauntlet on Nov. 24, 2011. I too hate the indifferent. We, as university students in the 21st century, have an unprecedented amount of potential laid out before us. We are inundated with information. We have immediate, instant and often limitless access to any event unfolding anywhere on globe. The tools for enacting change that are available to us are greater than ever before. The level of stability and the privileges that many of us are afforded give us amounts of leverage, mobility and general freedom that few people in history have ever been witness to. And yet most of us do nothing. We are all aware, or at least have the time, energy and resources to make ourselves aware, of the crises manifesting themselves both home and abroad. There is no valid excuse for looking at the world’s situation and responding with indifference. It is not enough to wait until things are finally so bad that we can no longer possibly continue — which is the failed logic of those, like so many amongst us, who only dream of potentials, of brilliant future histories, rather than realizing them. Or is it the case, rather, that even the imaginations of the many have also become indifferent?